February 2015 n Performance & Hotrod Business n 59 success using the Powermax45 for the past two years. What I like most about it are the three different settings: regular cutting for most cutting duties like completely removing a quarter panel or floor pan, chopping a roof and trimming the ends off a bumper; gouge mode for carefully carving away rusted bolt heads and old welds; and expanded metal mode for cut- ting away rusted sections of panels, which comes in very handy for restoration work. Plasma systems also make it easy to cut out new metal pieces like new panels or brackets for custom projects quicker than a band saw. Need to cut a rectangu- lar section from a large piece of material? Measure it off, clamp any straight metal edge along the desired cut line and run the torch along the line. The result will be perfectly straight, smooth edges on the newly cut piece. Last year Hypertherm released the Powermax30 XP, which can cut up to 5/8- inch metal. It has the capability needed for thick metal cutting, yet it can also be used for fine detailed, thin metal with its FineCut Consumables. It's a 30-amp machine that plugs into 110. It's a very portable unit that can accomplish most of what the bigger guys do. Hypertherm also came out with its HyAccess extended consumables for the Powermax torches that are longer and have narrower tips than regular consum- ables. It makes it easy to get into tight places with limited access. Plus, the nar- row tips make it even easier to use tem- plates when cutting out shapes. Serious Fabrication And that's what it's all about—making our job easier and more enjoyable. Another piece of equipment in my shop that has changed is the welding machine. I've always used Miller welders and our old Syncrowave water-cooled 250 still does a great job, but at almost 400 pounds it's not very portable. I've been using Miller's very portable Diversion 180 air-cooled TIG for two years now. 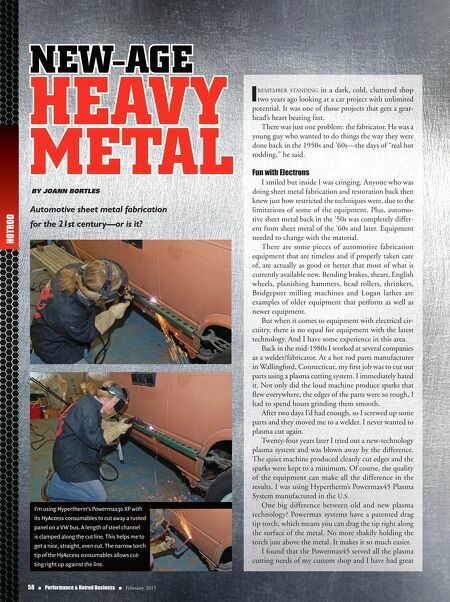 Twenty-five years ago, an air- cooled TIG machine was something I did not want to work with. But Diversion 180 has been a joy to use. Seriously, at 50 pounds it's smaller than a large suitcase and can plug into both 220 and 110. It's also easy to set up and use: two settings, choose your material and dial in the amps. 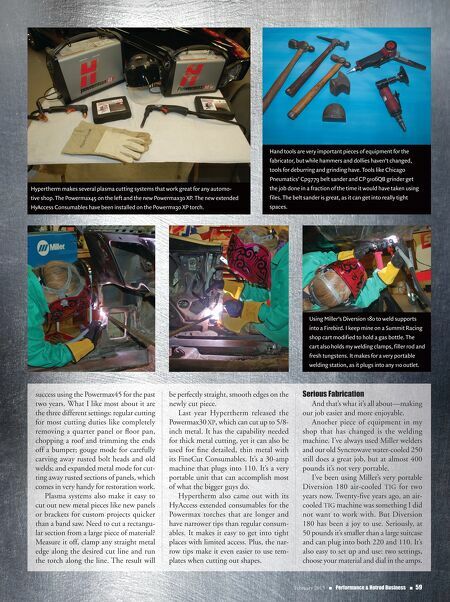 Hypertherm makes several plasma cutting systems that work great for any automo- tive shop. The Powermax45 on the left and the new Powermax30 XP. The new extended HyAccess Consumables have been installed on the Powermx30 XP torch. Hand tools are very important pieces of equipment for the fabricator, but while hammers and dollies haven't changed, tools for deburring and grinding have. Tools like Chicago Pneumatics' Cp9779 belt sander and CP 9106QB grinder get the job done in a fraction of the time it would have taken using files. The belt sander is great, as it can get into really tight spaces. Using Miller's Diversion 180 to weld supports into a Firebird. I keep mine on a Summit Racing shop cart modified to hold a gas bottle. The cart also holds my welding clamps, filler rod and fresh tungstens. It makes for a very portable welding station, as it plugs into any 110 outlet.